More than a Gravel bike the Exploro is a road bike when fit with road tires. The Exploro is the closest thing on the road to the one bike that does it all. It's aero quality's make it as fast and maybe faster than most road bikes. It's super high mod carbon makes it as light and stiff as the best road bikes as well. Add the ability to run 650b and 700c x 40mm gravel tires and this one bike is like no other. 3T didn’t want the Exploro to be fast in theory, but in the real world. So they tested at a realistic 20mph (32kmh) instead of the standard 30mph (48kmh) and optimized the frame for water bottles (tough to do long, epic rides without). They even designed the Sqaero shape to work well when covered in mud! The result? 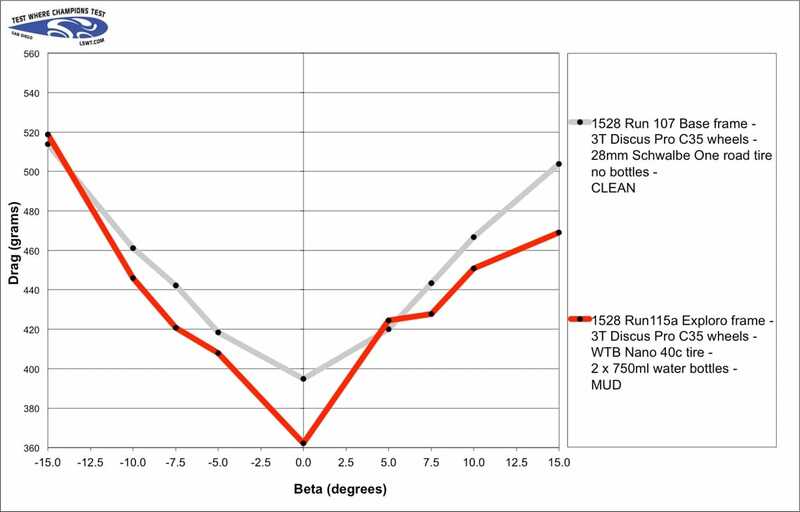 A muddy Exploro with 40mm knobby gravel tires and 2 water bottles (red line in the graph) is faster than the equivalent clean round tube bike is with 28mm slick road tires and without bottles (grey line).